DNG stands for Digital Negative Format. Created by Adobe it is an open standard with a published specification. This is where it differs from the raw format that your camera is outputting. For Nikon the format is NEF, for Canon CR2 and for Lumix it’s RW2. They are all raw formats but locked down ones. By using NEF for example we buy into the notion that Nikon will always be around. DNG is a loss less and non destructive format, just as the other raw formats. But my camera’s output is NEF/CR2/RW2? I use more then one camera manufacturer. This gives me multiple file formats in my library. Multiple file formats might not be a direct problem. In the longer run it will introduce complexity in management. More formats to keep up to date with and watch for changes and compatibility for. Changes could also come with new hardware. All these can be converted into DNG for a single file format. You would loose none of the information in the files. My post production process is using Adobe products. Lightroom is my library and post production environment. Photoshop by photo manipulation software. Given this, the DNG file format is even more interesting. 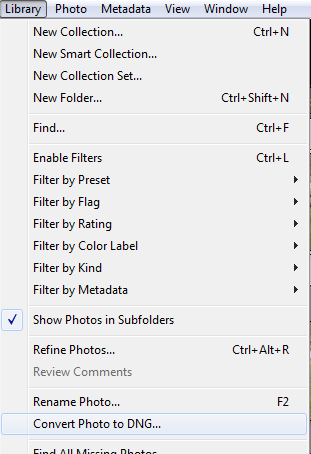 Lightroom can convert to DNG from within the library. Single file or whole folders. If not using Lightroom, Adobe have a free stand alone DNG converter (Windows/Mac). This can also be used in the field if you do not have a laptop running Lightroom packed. A large library with external backup is nothing I would convert off. Conversion takes some time and re-send all data also. All my new files imported into Lightroom are DNG and I am converting library piece by piece. Oldest files first. By converting to DNG I know there is an active community that will keep me and the format updated. I will also simplify the amount of formats in my library. DNG files against my Nikon NEF files are about ten percent smaller. Space itself might not be an issue. But transmitting all that data to external backup site will take time. Every saved megabyte is welcome.